The overweight and obesity among military personnel, as an occupational group, beside the health issues, might affect their military performance. A systematic review and meta-analysis were conducted to estimate the pool prevalence of overweight and obesity among Iranian military personnel. The national databases including Science Information Database, MagIran, and the following international databases; Web of Science, Medline via PubMed, and Scopus were searched, up to December 2017, for relevant published studies without time limitation. Totally,1431 studies were reterived and 10 studies included in meta-analysis. The pooled prevalence of overweight and obesity were 41% (95%CI:26, 57%) and 13% (95%CI:10, 17%), respectively. In the subgroup analyses, a lower and higher prevalence of overweight was reported in the ground (12%) and Navy (69%) forces military, recpectively. For the obesity, the air forces had the lowest prevalence (11%) and the ground and Navy forces military had highest prevalence (15%). The prevalence of overweight and obesity were slightly higher in studies conducted after 2014. Our findings suggest a high prevalence of overweight and obesity in the military personnel as a high-risk occupational group. Owing to the high observed heterogeneity among the included studies, large representative studies are needed to estimate the prevalence of overweight and obesity in the military personnel. Global data indicate that overweight and obesity are two of the major public health concerns in all population age groups . According to the World Health Organization (WHO) report, during the past four decades, prevalence of overweight and obesity has been dramaticaly increased in the general population . In 2016, 39 and 13% of adults in the world were overweight and obese, respectively . The overweight and obesity are defined as abnormal or excessive fat accumulation in the body [1, 2]. Based on the WHO classification, individuals with a body mass index (BMI) between 25 and 30 and more than 30 are considered as overweight and obese, respectively . Obesity is caused by several factors including genetics, metabolic, socioeconomic status, enviromental and behavioral factors . The underlying reported association between overweight, obesity and many chronic diseases such as cardiovascular disease, diabetes, rheumatoid arthritis, hypertension, physical inability and respiratory illness have reoinforced the importance of these public health concerns [1, 4, 5]. Several studies have shown that obese or overweight people are more likely to experience a higher morbidity and mortality than those with normal weight [6–9]. It is now well-acknowledged that occupation-related factors could have an important role in the prevalence of overweight and obesity [10–13]. Military personnel as an occupational group are at higher risk of stressful conditions, exposure to death or harmful agents as well as imposed restriction on food selection or availability. Having an ideal body weight and fitness is a fundamental principle in military forces recruitment. Beside of an imposed undesirable health outcome, overweight and obesity can affect the productivity of military forces during both peacetime and combating operations . Considering the physical training of military forces, it is expected that their weight would be normal than the general population. Nonetheless some evidence suggest that the overweight and obesity prevalence have an increasing trend in the US military over the past two decades. [15, 16] Several studies in different countries reported a relatively high prevalence of overweight and obesity among military forces [17–21]. Fajfrová et al., in their 11-years follow-up study among the professional soldiers in Czech Army, reported a gradually increased prevalence of overweight (52 to 57.1%) from 1999 to 2009 . In Saudi Arabia, prevalence of overweight and obesity among active military personnel were estimated at 40.9 and 29%, respectively . Another study in Greek warship personnel reported prevalence of overweight and obesity as 26.5 and 4.7%, respectively . In Iran, a various prevalence of overweight and obesity has been reported among military forces, ranged from 11.5 to 69% and 6.2 to 23.1%, respectivly [22–31]. Notwithstanding the diversity in the reported prevalence of overweight and obesity, a pooled estimation of overweight and obesity prevalence is greatly warranted for planinng effective therapeutic and preventive interventions among military forces. We aimed in this study to estimate a pooled prevalence of overweight and obesity among military personnel in Iran by using a systematic review and meta-analysis. Preferred Reporting Items for Systematic Reviews and Meta-Analyses (PRISMA) checklist and flow diagram were used for designing and reporting the procedure . The following national databases including Science Information Database (up to December 2017); Magiran (up to December 2017), as well as the following international databases including Web of Science (up to December 2017); Medline via PubMed (up to December 2017); Scopus (up to December 2017) were searched. The search strategy for PubMed was as follow: ((“Body Mass Index” OR “Obesity” OR “Obesity, Abdominal” OR “Overweight” [Mesh]) AND (“Military Personnel” OR “Army personnel” OR “armed forces” OR “security forces” [Mesh]) AND Iran). Similar specification was used for the other databases. Also, a manual search of references list in selected articles was conducted. In the case of unavailability of full texts or missed information, we attempted to obtain the full text or information from authors by email. We included all cross-sectional studies that have examined the prevalence of obesity and overweight using BMI in Iranian military forces, regardless of time and location of the studies, age and military service type of the studied population, and publication language (Persian or English) of the studies. In the present review, the outcome was the prevalence of obesity and overweight in the Iranian military. Since BMI has been recommended as a standard and common measure for overweight and obesity , we excluded the studies that reported the prevalence of overweight and obesity based on waist circumference or hip-waist ratio. For appropriate selection of the realted articles, two reviewers conducted literature search independently. The two reviewers were not blinded to the articles’ author names, journal name and results. Any discrepancy between the two reviewers, it was resolved by negotiation or with the guidance of a third person. After selecting the studies, the related variables in each study including the study type, sample size, number of overweight and obesity patients, demographic characteristics of participants, time and place of study were entered in pre-designed Microsoft excel data sheet. Strengthening the Reporting of Observational studies in Epidemiology (STROBE) statement  was used for evaluating potential biases in the included studies. Six methodological related items from STROBE were applied on the selected studies, including: 1) “description of study design”; 2) “specific objectives or hypothesis”; 3) “description of setting, locations, and time scales for outcomes”; 4) “eligibility criteria, major sources and methods of recruiting participants”; 5) “clearly define primary outcome”; and 6) “description of how a study sample was arrived at”. Each item was scored as fully satisfied (2 score point), partially satisfied or can’t tell (1 score point) and unsatisfied (0 score point). Finally, the studies with a total score of ≥10,7 to 9 and ≤ 6 classified as high-quality, intermediate-quality, and low-quality studies, respectively. The quality assesment of the studies was carried out independently by two reviewers (YS and MT). Any disagreement between the two reviwers was resolved through negotiation with the third reviewer (MS). The exclusion of studies was not based on the quality assessment scores. We examined statistical heterogeneity using the chi-square χ2 test. P-value less than 0.05 was considered as heterogeneity. Inconsistency between the studies was evaluated using the I2 statistic, higher I2 values indicating greater variability among studies than would be expected by chance alone (range: 0–100%) . We also estimated the between-study variance using tau-square (Tau2) statistic . The Begg and Egger tests were conducted to assess the publication bias [35, 36]. Meta-analysis to estimate pooled prevalence was conducted using a random-effects model  with 95% confidence interval (CI). We conducted four subgroup analysesto examine the possible effects of the included studies quality, geographic region of Iran, year of study, and type of military force. The Stata version 14.0 software (Stata Corp, College Station, TX) was used for the data analysis and all statistical tests were two-tailed. For Begg and Egger tests, p-value less than 0.1 was considered as a statistically significant, but for other tests p-value less than 0.05 was considered as a statistically significant. Totally 1431 records up to December 2017 were retrieved using our search strategy. Of them 506 duplicate records were excluded. We also excluded 893 articles after screening their title and abstract. The full text of the remaining 32 studies were screened, and 22 studies were excluded (Fig. 1). Finally, 10 full-text articles were included in the meta-analysis that estimated the overweight and obesity pooled prevalence. Overally, these 10 studies included 17,920 participants. Two of the included studies did not report the obesity information, therefore the summary measure for the obesity outcome was estimated for 8 studies. The Fig. 1 depicts a diagram regardingthe flow of information in this review study. The included studies were conducted mainly Tehran (n = 6). One study was conducted at the national level. Five of the 10 studies included a sample of all military force units and one study recruited a sample of navy force unit. Table 1 shows the characteristics of the 10 included studies in the meta-analysis. Based on the random-effects model, the pooled prevalence of overweight was 0.41 (95% CI:0.26, 0.57), with a considerable heterogeneity (chi2 (9) = 2210.48, p < 0.001; I2 = 99.59%). Also, the pooled prevalence of obesity was 0.13 (95% CI:0.10, 0.17), with a remarkable heterogeneity (chi2 (9) = 71.24, p < 0.001; I2 = 90.17%) (Fig. 2a and b). The between-study variances tau2 for the overweight and obesity were 0.26, and 0.02, respectively. The highest prevalence of overweight (69%) was observed in the study by Sartang et al. , and the lowest prevalence of overweight (11.5%) was reported by Pourtaghi et al. . The results of Begg test for overweight was statistically significant (p = 0.005), whereas the Egger test for overweight was not statistically significant (p = 0.421). For obesity, the results of Egger and Begg test indicating that there is no publication bias (p = 0.588 and p = 0.805, respectively). All of the included studies specified their objectives or hypothesis. Only one study did not report the type of the study design . Two of the studies did not provide clear description of the study setting/location and time scale for the outcomes [30, 31]. Also, only one study reported that how the study sample size was arrived . Two of the included studies did not report the obesity information [30, 31]. The quality of the included studies have been presented in Table 1. We conducted four subgroup analysis to address the effect of the location of the study samples, year of publication, type of military force, and quality of the included studies as potential source of the observed heterogeneity. Although, the heterogeneity was still appreciable for all subgroups. In the subgroup analysis, a lower prevalence of overweight was reported in the ground forces military. For the obesity, the air forces had the lowest prevalence. The prevalence of both overweight and obesity were slighty higher in the recent studies (After 2014 vs. before 2014) (Table 2). The prevalence of overweight in the high quality studies (0.50; 95% CI: 0.36, 0.63) was higher than intermediate (0.48; 95% CI: 0.46, 0.50) and low quality (0.24; 95% CI:0.07, 0.47) studies. The aim of the present review study was to estimate the pooled prevalence of overweight and obesity among Iranian military personnel. Our findings showed that the pooled prevalence of overweight and obesity were high (41 and 13%, respectively). However, the estimated prevalence in our study was lower than those reported among 40-year-old Royal Brunei armed forces (60.1 and 12.1%, respectively) . Our estimated prevalence of overweight is comparable with those reported by Horaib et al. conducted among 10,500 active military personnel in Saudi Arabia (41% VS. 40.9%) . However, the prevalence of obesity in our study was much lower than the Horaib et al’ study (13% VS. 29%). One study among 30–39 years old Nigerian military population found that 40.4% of personnel were overweight or obese . Several studies indicated an increasing trend in the prevalence of overweight and obesity in U.S. army [15, 40, 41]. In a recent paper by Hurby et.al, in which a trend in overweight and obesity from 1989 to 2012 among U.S. army were explored, the prevalence of overweight increased from 25.8 to 37.2% and obesity increased from 5.6 to 8.0% . Another study that was conducted among 18-year-old applicants in the U.S. military from 1993 to 2006 reported that the prevalence of overweight increased from 22.8% in 1993 to 27.1% in 2006, and the prevalence of obesity increased from 2.8% in 1993 to 6.8% in 2006 . Moreover, in other countries an increasing trend in the prevalence of overweight and obesity have also been reported. For example, Fajfrová et al., during a 11-year follow-up period among professional soldiers in Czech Army, demonstrated that prevalence of overweight gradually increased from 52 to 57.1% in 1999 to 2009 . Another study in Greek warship personnel reported prevalence of overweight and obesity as 26.5 and 4.7%, respectively . The worldwide prevalence of overweight and obesity in general population has been increased . This increase can affect military personnel as a subgroup of general population. However, in our review only four high quality studies were included that might affect the estimated pooled prevalence. A body of literature shows that overweight and obesity can play an important role in developming of cardiovascular disease, diabetes, rheumatoid arthritis, hypertension, physical inability, respiratory illness and risk of injuries [1, 4, 5, 43]. In a study by Rappole et.al among USA’s male army soldiers in an operational brigade, it is demonstrated that higher BMI was associated with risk of injury . In addition, psychological distress could be increased by overweight and obesity [44, 45]. These physical and psychological disorders can affect the best performance of military personnel. According to the related literature, there may be number of possible explanations for the high observed prevalence of overweight and obesity among military personnel; first, military personnel are at higher risk of stressful conditions, exposure to death or harmful agents and ongoing sleep deprivation. Current evidence shows that occupation-related factors have high impacts on the prevalence of overweight and obesity [10–13]. Several researches reported that overweight and obesity can be associated with work environment and higher work related-stress [10–12, 14], including poor eating habits, intake higher energy, saturated fat, and sugar [46, 47]. Stressful environment may result in increasing appetite through cortisol reactivity [48, 49]. However, some people may lose weight when affected by stress . In addition, it is well known that sleep disorder is associated with body weight and adiposity [51, 52]. Second, food selection or availability may have an important role in overweight and obesity among military personnel [53, 54]. It is important to encourage general population to healthier foods consumption as opposed to energy-dense and low nutrient foods in the childhood . Also, it is recommended that a healthier food menu along with food portion control should be provided at military dining facilities. Third, BMI as one of the inclusion criteria in the present study is the mostly common population-level index for measuring overweight and obesity. Military personnel are often assumed to be younger and more active people than general population. It should be noted that BMI may not accurately reflect the body fat and its distribution [55, 56]. One study that was conducted to evaluate the validity of different measures in categorizing overweight or obesity among overweight or obese active duty military personnel in USA, found a high rates of false negatives for both waist circumference and BMI compared to body fat percentage . Therefore, BMI cannot differentiate between the adipose tissue and muscle mass in military personnel . According to our results, there was a considerable heterogeneity among the included studies that explored with the subgroup analyses. The subgroup analyses indicated that the prevalence of overweight among Ground (12%) and Navy forces (64%) were lowest and highest, respectively. The studies that were conducted recently (after 2014) reported a slightly higher prevalence for both overweight and obesity. The prevalence of both overweight and obesity in high-quality studies were higher than others groups. The low-quality studies reported a lower prevalence of overweight and obesity compared to the intermediate-quality studies. Previous evidence shows that small studies, due to lower methodological quality and larger heterogeneity, tend to report not only larger effect sizes, but also less precise estimates of between-study heterogeneity [59, 60]. Also, we did not include unpublished studies which might be smaller studies that were not submitted or accepted for publication. This limitation may affect the estimated pooled prevalence in our study. The findings of the included studies should be interpreted with caution owing to the inconsistency in sampling designs, sample sizes, and response rates. The present review suggests that further studies should to pay more attention to basic methodological aspects to estimate valid and precise prevalence of overweight and obesity in military personnel. This study had four main limitations. First, unpublished researches were not included. It’s may be one of the possible explanations for significant result of Egger test for overweight. Although, the Begg test have very low power to detect publication biases, hence shows a non-significant result for overweight. Second, six of the included studies had not high quality, which may affect the pooled prevalence. Third, for obesity, two studies could not be included because they did not report the obesity prevalence. Finally, we were not able to reduce the appreciable observed heterogeneity by using sub-group analysis. 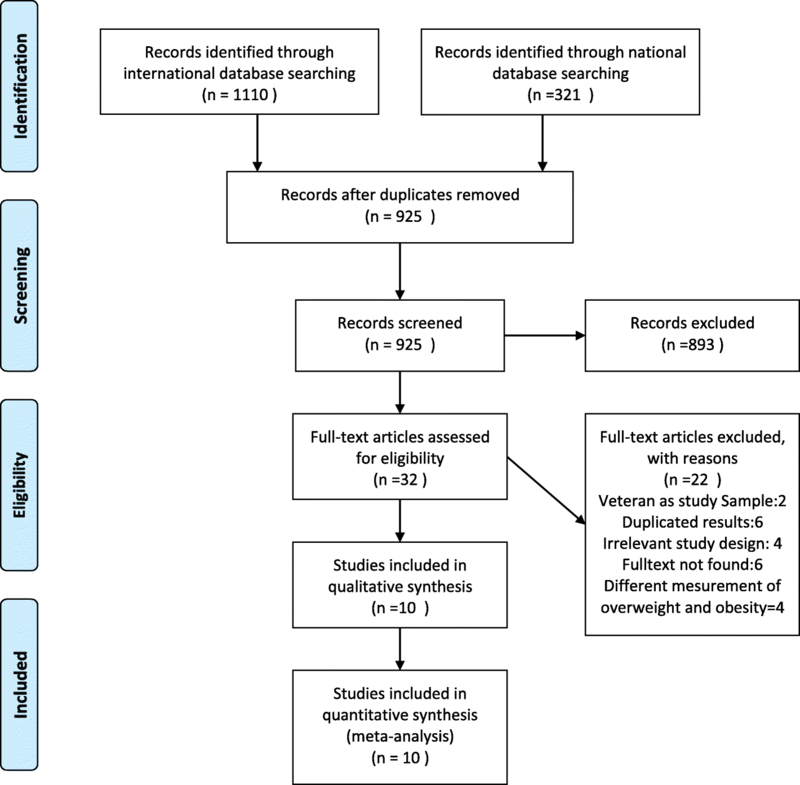 The present systematic review and meta-analysis highlighted that the overall prevalence of overweight and obesity among military personnel is considerable. Considering the high observed heterogeneity between the included studies large representative studies are needed to estimate the prevalence of overweight and obesity in the military personnel. It may be useful to consider selective prevention programs that address overweight and obesity based on type of military force. We would like to thank all the authors who kindly provided the additional information for this review study. We did not receive any funds for conducting this review study. All data are provided in the table presented in the text. All of authors contributed to this project and article equally. All authors read and approved the final manuscript.